(CNS): Peter Hayes, the director for the overseas territories at the Foreign & Commonwealth Office will be making a short visit to the Cayman Islands next week to meet with a number of government officials and according to a statement from the governor’s office to promote the shared agendas between Britain and Cayman. Hayes will arrive in Cayman on Monday 3 March and then will leave the following day. Hayes said he was looking forward to meeting the premier and visiting the new health city. “The visit follows on from the premier’s visit to London earlier this month and will focus on enhancing the relationship between the UK and Cayman Islands and promoting our shared agendas,” said a spokesperson for the governor’s office which is hosting Hayes. The OT director will have meetings with the premier, the attorney general and the police commissioner and will call in on the Cabinet meeting. Other engagements will include a meeting with opposition MLAs, a visit to Shetty’s Health City, as well as Northward prison. The FCO bureaucrat will also be taking a tour of the Mission House in Bodden Town with the National Trust. The premier will also host a reception and Hayes will attend a dinner hosted by Cayman Finance. 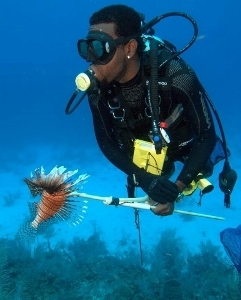 “I am delighted to bevisiting the Cayman Islands again,” said Hayes. “I am particularly looking forward to discussions with the Premier and to visiting the Shetty Health City, a welcome indicator of the diversification of the Cayman Islands’ economy,” he added. (CNS): The opposition leader is calling on workers to unite to protect their own rights and advance their skills so they can address some of the ills in the modern workplace and unemployment. 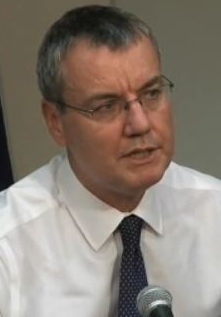 McKeeva Bush has denied that this proposal is a union, even though he expected people “to smear it” as such, but he said that while there were enough advocacy groups, such as the C4C and the Chamber of Commerce, in Cayman representing the interests of business and employers, the country’s employees were unrepresented. He said that, given the increasing challenges facing them from the pressure of a global workforce and cheap labour, workers needed to try and advance their own cause. Speaking on the new series of Cayman 27’s talk show, The Panel, on Tuesday evening, Bush said he would not be leading or setting up this alliance but wanted to promote the idea. He said he wanted to help those who had talked to him about creating a formal association to represent workers, from hotel employees living on low wages to young lawyers not able to find articles. The opposition leader said participatory democracy meant everyone should have their say but at present most issues are decided by employers, with the people only invited to speak on election day. Bush claimed a long history of promoting workers’ rights, from pensions to maternity pay, as well as holidays and overtime, during his time as a politician. He said that workers' rights have come a long way but new technology had brought many new challenges for the local workforce, not least the impact of outsourcing and cheap labour. He spoke about past times when workers received fair wages in their jobs and said that before now, Cayman never had a situation where people were living 20 to a room because theywere earning only $5 per hour. The workers alliance idea, he said, could ensure a level playing field and give local people the opportunity to compete for jobs. “It is not a union,” Bush stated. He said he wanted workers to start the discussion and create an organisation focused on helping people find work, improve their skills learn about their rights and build awareness in all of the major sectors, while still recognising the commercial realities. He said the National Workforce Development Agency (NWDA), which was created by the former labour minister, Rolston Anglin, "was practically useless” but whoever formed the workers' alliance would still need to work with government, this agency and within the boundaries of the labour laws. Asked by the show's host, Tammie Sulliman, why Bush had failed to create or promote such an alliance when he was premier, he insisted that he was fully occupied trying to keep Cayman afloat, tackling the budget and public finances and fighting red tape, as well as dealing with the media, which he blamed for blowing everything out of proportion. Bush said that the current government has four ministers now doing the job he had done, and he said government could not do everything. He said that no government would be able to help the workers because of the pressure from business and the civil service stopping everything. See Bush on the panel here. (CNS): A catalogue of unforeseen circumstances resultedin two silent courtrooms this week, despite a mounting case load in the local criminal justice system. 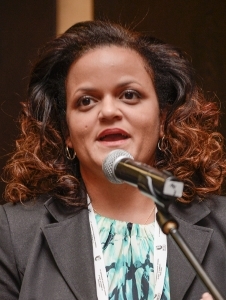 Although three trials were listed to take place in the Grand Court over this week and next in each of the main courthouse building rooms, with a third as back-up, last minute guilty pleas in a robbery trial and a mistrial in a corruption case saw the two scheduled cases end in less than two days. However, difficulties coordinating some 23 witnesses in a reserve trial regarding a fraud case meant that it could not proceed either, leaving the courts empty for the next week. Although cases are backing up for over a year for those on bail and close to ten months for those on remand, the number of variables in any trial means that the courts are unable to call any last minute cases. While court staff and the judiciary have plenty to keep them occupied until the next timetabled cases, precious court time is being unavoidably wasted when the local justice system, as noted by the chief justice at the recent opening of the Grand Court, is falling short of international standards when it comes to the time line in disposing of cases. 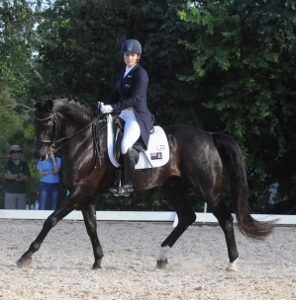 (CNS): Qualified dressage riders from across the Cayman Islands will compete in the Federation Equestre Internationale’s World Dressage Challenge (WDC) on Saturday 8 March when Olympic hopeful, Jessica McTaggart will also be looking for a chance to gain her second qualifying score for the Central American and Caribbean (CAC) Games. Since October last year, Cayman Islands Equestrian Federation riders have been training to qualify for the WDC an annual dressage competition between countries in the Caribbean region developing in the sport. Riders ride FEI prescribed tests on their own horses in their own countries and two FEI judges travel around the region to judge all competitors. Each country picks a team of four riders to represent their country and their scores are measured against the teams from the region to produce a winning nation. Last year the Cayman Team of Thea Millward, Jessica McTaggart and sisters Polly and Phoebe Serpell, came third in the Challenge. Cayman riders are always looking to improve and this year is no exception. Team riders will be hoping for a high finish again in 2014 and this hope is bolstered by the recent arrival of a number of new talented and experienced horses. McTaggart with her eye on the Central American and Caribbean (CAC) Games which will be held in Veracruz, Mexico in November said she was really pleased to get the first qualifying score she needed last month. “My training has been going well since then and it has been extremely helpful to have dressage trainer, Cindy Thaxton, of High Point Farm, Atlanta, here,” she said. “She has been in Cayman to help me, and all the other Cayman dressage riders, to prepare for the next dressage show in March. Cindy has been my trainer for many years and has a broad experience of overseas competition and training. The dressage show in March will be my chance to attain a second and final qualifying score for CAC. I'm hoping my horse, Ray of Light, continues to perform as consistently as he has been so that we can represent Cayman in Mexico in November of this year." As well as assistingelite riders like McTaggart, the CIEF also plans for the future. The youngest riders will also get an opportunity to test their skills at the show next month in the USDF and USEF Test classes which will be offered after the WDC element has been completed. The word ‘dressage’ is a French term, meaning training. Very simply, dressage is the art of striving for a harmonious and hardly perceptible communication between horse and rider. When you watch the dressage Masters, you can barely see their hands and legs move, but every inch they do move is a separate instruction to the horse to perform a particular action. Dressage is said to originate from military riding where horses were constantly used in war, but it has come a long way since then and is now an elegant and refined Olympic sport. “So if you think of ‘passage’ as a corridor and ‘piaffe’ only conjours up for you memories of French divas with no regrets, come along to the dressage show, “officials from the local equestrian federation said. The event takes place on Saturday 8th March at 3pm at the equestrian centre, off the Linford Pierson highway George Town. 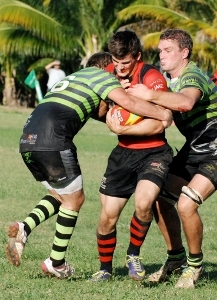 (CRFU): Domestic rugby took a break recently with successful campaigns against visiting American sides from Middlebury College and Princeton University Alumni but re-started on 22 February with two all important games to mark the midway point of the Alex Alexander Memorial Trophy competition. With the Pigs Trotters having won their first two encounters against the John Doak Architecture Iguanas and the Advance Fire and Plumbing Buccaneers it was up to the Fidelity Bank Cayman Storm to stop the Trotters march to their first league trophy since 2003. The Trotters took no time in finding the score sheet as some quick phase play put Dave Acutt over the try line to open the scoring only minutes after kick off. But in a surprise rebound the Cayman Storm mounted 17 unanswered points in a stunning display of ball handling and tenacity. The run of form for the Storm was short lived however and the 17 points were to be the Storm’s haul for the day. The Trotters mounted a comeback of their own and tallied up a further 20 points before halftime to bring in a half time score of 25-17 for the Trotters. The 2nd game of the day saw the Iguanas pile 31 points on the Buccaneers before the Buccaneers responded in the 2nd half of the game to put their name on the score sheet. The Buccaneers controlled the bulk of the possession and were dominating the Iguanas in the lineout and scrums but it was the Iguanas who took every opportunity possible to find their way to the try line and with an impressive performance from the Iguanas back line the final score of 38-12 was never in doubt. The big win for the Iguanas saw that team leapfrog the Buccaneers into 2nd place on the league table. Week four of action may decide the league outcome as the Iguanas take on the Pigs Trotters and with only 3 points separating the 2 teams the Iguanas will be looking to overturn their early season loss to the Pigs whilst the Trotters will be doing everything in their power to stop an Iguana attempt toretain their championship. The Storm face the Buccaneers and the Buccaneers will look to put the embarrassing loss to the Iguanas behind them whilst the Storm will look to build on some promising displays on the pitch to earn their first win of the season.